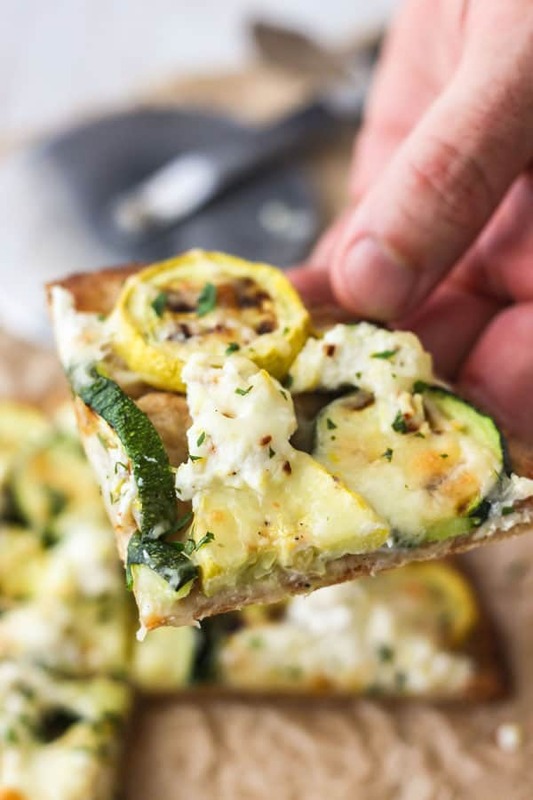 Broiled zucchini and lemon ricotta flatbread is a fun summer meal for one or appetizer for two and a great way to use up zucchini and yellow summer squash! The secret to making this veggie pizza super EASY is using a premade flatbread. I married a man who absolutely LOVES pizza and all things pizza-related. That’s why you’ll find recipes for pizza spaghetti squash, calzones, tortilla pizzas and pizza bagels on TOL. But I have a little confession. I don’t really like pizza, at least not the way it’s usually served: with red sauce. 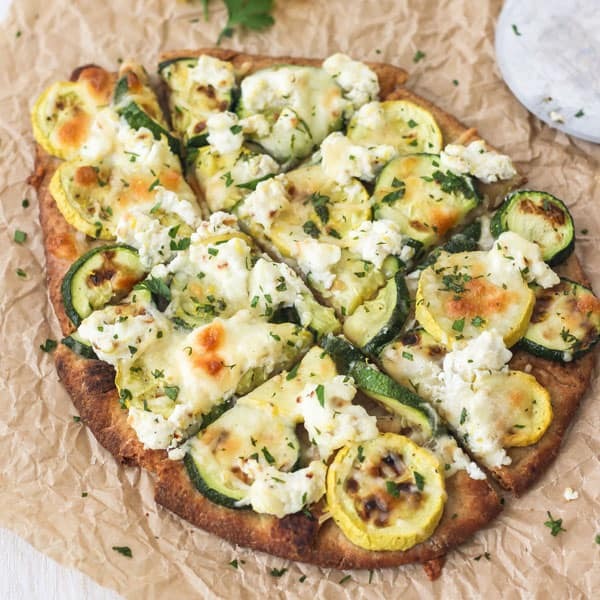 So I was thrilled when I came across a grilled zucchini and ricotta flatbread recipe on Bon Appetit. It had fresh veggies, ricotta cheese, and no red sauce – it sounded like heaven and something we’d both enjoy. To make this work in our toaster oven we broiled a yellow squash and a zucchini (instead of grilling them). 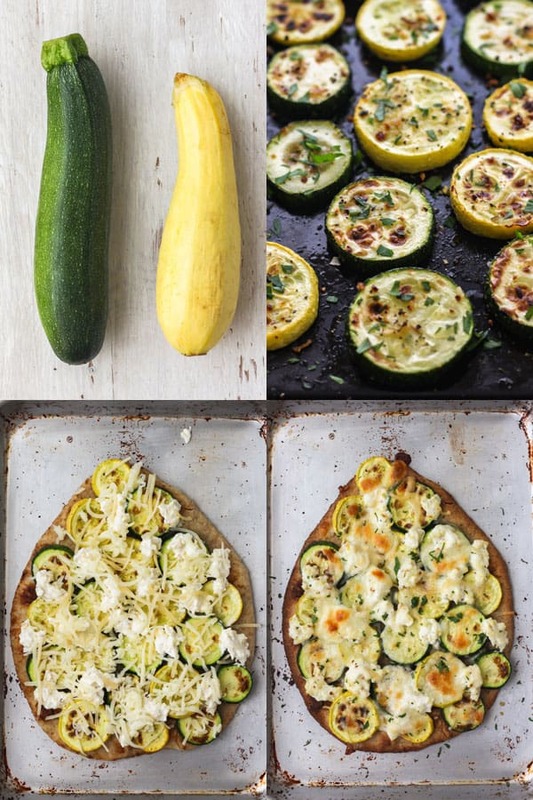 Broiling zucchini using your toaster oven is super easy and takes just a few minutes. Since both of us are lemon fanatics we added lemon zest to the ricotta (sooo good!). Then we swapped out the pizza dough for a premade naan flatbread. Thick and chewy naan is a superstar in our house, you can tear it in half to make wraps, top with hummus and veggies for a quick lunch or make a sweet flatbread fruit pizza. Small Household Cooking Tip: Since we’re not making naan pizza every week I usually buy a package and keep it in the freezer. The flatbreads defrost quickly and don’t get soggy. Lastly, to give the flatbread more of a pizza-vibe we topped the whole thing with shredded mozzarella cheese. The edges of the flatbread got really crispy but the middle stayed soft and chewy. 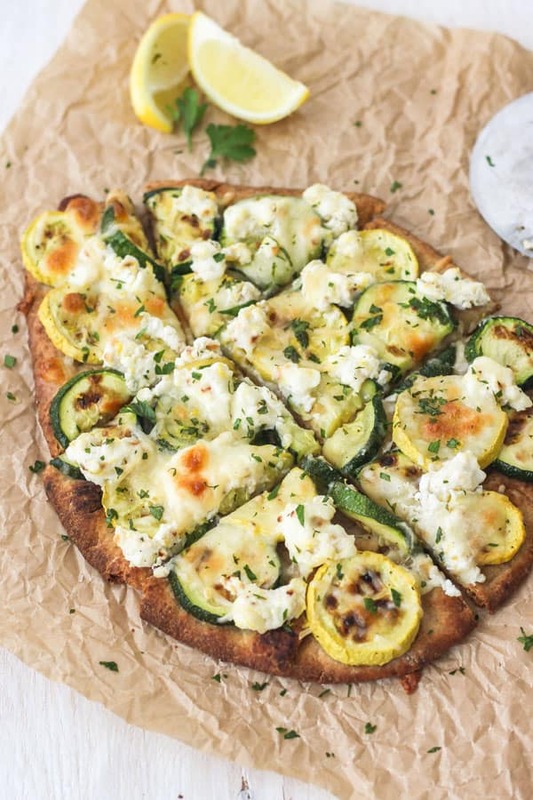 Lemony ricotta + buttery broiled zucchini is THE BEST, seriously. The real standout though is the lemon wedges, they are genius! Squeeze one over a slice right before eating, it brings out the best in every ingredient and keeps all of those cheeses from feeling too heavy. 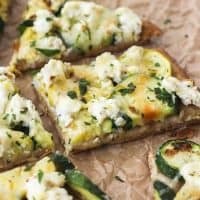 Zucchini and lemon ricotta flatbread is a fun summer meal for one or appetizer for two and a great way to use up summer squash. Adjust toaster oven cooking rack to the top position. Slice the zucchini into 1/2-inch thick rounds and toss with oil, salt, and pepper. Place rounds in an even layer on a roasting pan and broil for 3 to 4 minutes. Carefully remove the pan and flip the zucchini. Broil the other side until browned in spots, about 3 to 4 minutes more. 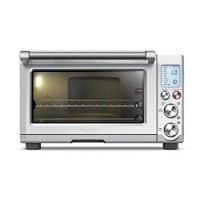 Adjust the toaster oven cooking rack to the bottom position and preheat to 400F on the Bake setting. 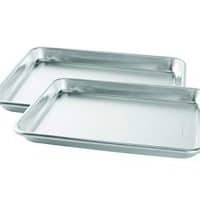 Lightly oil a baking pan. Zest the lemon. Mix lemon zest with the ricotta and red pepper flakes. Taste the mixture and season with salt and black pepper. 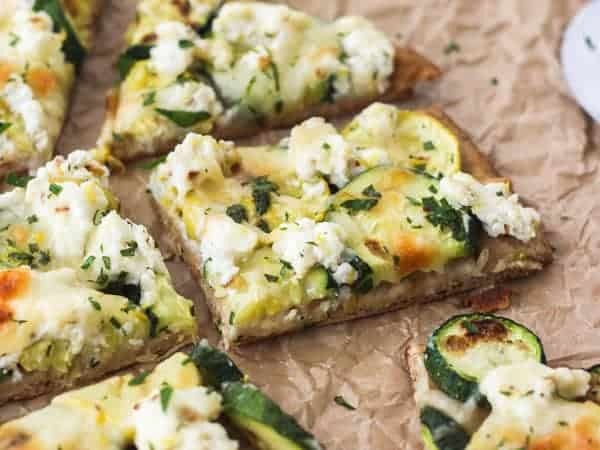 Arrange zucchini slices on the flatbread and dollop with ricotta mixture. Top with parmesan and mozzarella. Cook pizza until the cheese is melted and bubbly, about 10 to 12 minutes. Top with parsley. Cut the lemon into wedges and serve with pizza for squeezing over slices. Authentic Parmesan cheese contains rennet (sometimes called enzymes) which is not vegetarian. We found a tasty grated parmesan cheese at Trader Joe's that is made with microbial rennet which is vegetarian. Also, we've heard Organic Valley and some Whole Foods branded cheeses are vegetarian-friendly and made with microbial or vegetable rennet too. Use It Up and Waste Less! Leftover Ricotta Cheese: Top baked potatoes with a dollop or two instead of sour cream. Make a quick and easy dessert by stirring together ricotta and cinnamon, then drizzle with honey and serve with apple slices, graham crackers or cinnamon baked tortilla chips for dipping. For a more savory option, substitute ricotta for the Greek yogurt in a batch of freezer-friendly Southwestern Twice Baked Potatoes. Leftover Parmesan Cheese: All roasted vegetables taste great with the addition of parmesan cheese, try topping your next batch of roasted broccoli, Brussels sprouts or roasted asparagus spears with one to two tablespoons about 4 or 5 minutes before the end of the recipe’s cook time. Have you got a great tip for using up leftover ricotta or parmesan cheese? Don’t be shy, share the love and leave a comment!